Samajwadi Party candidate Azam Khan, caught on camera making disgusting comments while railing against his BJP rival Jaya Prada in Uttar Pradesh's Rampur constituency, has been charged in a police complaint and has also been asked for an explanation by the National Commission for Women. At a rally on Sunday, he had said, "...the underwear beneath is of the khakhi colour" in comments that were widely interpreted as directed at actor-turned-politician Jaya Prada, his former colleague. Lacerated for the comments, he claimed today the words were not against Jaya Prada as he never took her name. "I was a nine-time MLA from Rampur and have been a minister. I know what to say," the SP leader said in a retreat following outrage and condemnation of his comments. Many are skeptical about that claim. This is what the SP leader had said: "For 10 years the person sucked the blood of Rampur, I held that person's finger and brought the person to Rampur. I made her familiar with the streets of Rampur. I didn't let anyone touch her. No dirty words were used. You made the person your representative for 10 years. Hindustan waalon , uski asliyat samajhne main aapko 17 baras lag gaye (understanding the person's real face you took 17 years). I realised in 17 days that the underwear beneath is of the khaki colour." The colour Khaki is associated with the Rashtriya Swayamsevak Sangh (RSS), the ideological mentor of the BJP. 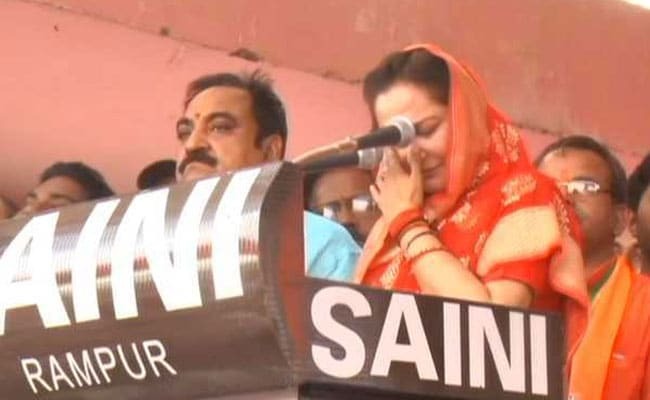 Jaya Prada had won the Rampur Lok Sabha seat in 2004 and 2009 but was expelled for alleged anti-party activities in 2010. She joined the BJP last month and was immediately named as the party's candidate for Rampur against Samajwadi's Azam Khan, her one-time colleague turned bitter adversary. Jaya Prada has in recent weeks alleged that she left Rampur after her "indecent images" were circulated and attempts were made to attack her with acid. "Azam Khan shouldn't be allowed to contest elections. Because if this man wins, what will happen to democracy? Should I die, then you'll be satisfied? You think that I'll get scared and leave Rampur? I won't leave," she said. The BJP as well as the Congress have strongly criticised Azam Khan's remarks. Senior BJP leader and union minister Sushma Swaraj took to Twitter and drew an analogy from Mahabharata when Draupadi was being disrobed. She asked Mulayam Singh Yadav, founder of Samajwadi Party and former UP chief minister, not to make the "mistake" of staying silent just like Pitamah Bhishma, when Draupadi was disrobed by Duryodhana in Mahabharata. Even the Congress, which is fighting the elections on the same side as the Samajwadi Party, called for action against Azam Khan. "Statement of #AzamKhan on #Jayaprada represents ugly and cheap standards. Such statements are derogatory for the health of a vibrant democracy. Hope that the ECI and @yadavakhilesh would take cognizance of the statement and ensure action against it," tweeted the party's Abhishek Manu Singhvi.